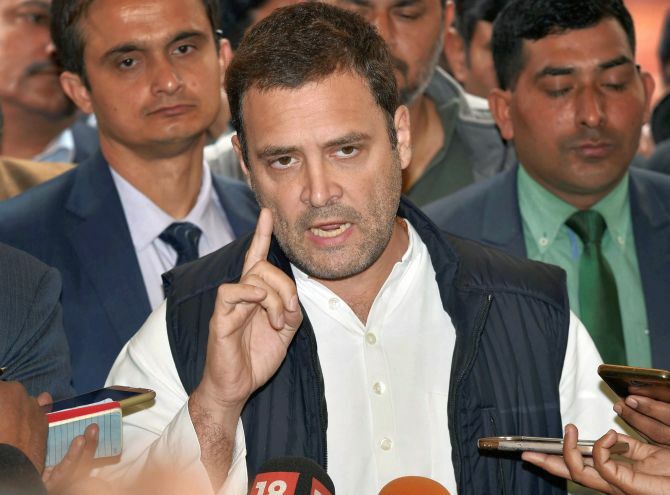 The Supreme Court on Monday directed Congress president Rahul Gandhi to give an explanation by April 22 for 'incorrectly' attributing his 'Chowkidar Narendra Modi chor hai' remarks to its verdict in the Rafale case and said it will consider a criminal contempt petition filed against the opposition leader. The court gave the direction on the petition filed by Bharatiya Janata Party MP Meenakshi Lekhi in which she has accused Gandhi of attributing some observations to the apex court which was not in the April 10 Rafale judgment on admissibility of certain 'leaked' documents as evidence. Stating that it will consider the criminal contempt petition, the court made it clear that the remarks made by Gandhi in public have been 'incorrectly attributed' to the court. Posting the matter for further hearing on April 23, the court also said politicians should not attribute any findings or views to the court in their speeches. Reacting to the direction, the Congress said it will provide an explanation to the Supreme Court while the BJP asserted that the top court has exposed Gandhi's 'lie'. Finance Minister Arun Jaitley accused Gandhi of 'manufacturing' a court order for political propaganda and asserted that the 'right to free speech' is not 'right to falsehood'. BJP chief Amit Shah also attacked Gandhi for 'lying' over the court order on the fighter jet purchase deal. "The Supreme Court heard the (Rafale) case on a preliminary technical objection. The Supreme Court passed its judgement, and Rahul baba started saying the Supreme Court had rebuked the government on the Rafale issue. In reality, no such thing happened," Shah said during an election rally in Gujarat. Lekhi, a sitting Lok Sabha MP from New Delhi constituency, had moved the court, alleging that Gandhi attributed his personal remarks to the top court and tried to create a prejudice. Senior advocate Mukul Rohatgi, appearing for Lekhi, told the court that a gross case of contempt was committed by Gandhi. Rohatgi said Gandhi had come out in the public to make a remark that the 'Supreme Court in its judgement said Chowkidar Narendra Modi chor hain'. The Congress president had on April 10 claimed that the apex court has made it 'clear' that Prime Minister Narendra Modi 'committed a theft'. He had made the comments while interacting with reporters in Amethi after filing his nomination papers where he is contesting against BJP leader and union minister Smriti Irani. The apex court, which last December cleared the Modi government of allegations of irregularities over the Rafale deal with France, on April 10 said it will hear a review petition on the basis of some 'leaked' documents, referred to by the petitioners who have demanded a probe. It dismissed the government's preliminary objections claiming 'privilege' over them. After the court decision, Gandhi had said, "I am happy and I have been saying so for months that India's PM has given the Air Force's money to (industrialist) Anil Ambani, and the SC has accepted it. The SC is going to investigate it." After hearing Lekhi's petition, the top court gave a categorical clarification that in its Rafale judgment there was no occasion for it to make a mention of the alleged contemptuous observation that 'Chowkidar Narendra Modi chor hai' as has been attributed to it by Gandhi. "We make it clear that views, observations, findings attributed to this court in the alleged speeches, remarks made by Gandhi to media/public have been incorrectly attributed to this court. "We also make it clear that this court had no occasion to make such observation in as much as it was deciding legal admissibility of certain documents which were objected by the attorney general," a bench headed by Chief Justice Ranjan Gogoi said. The bench, also comprising Justices Deepak Gupta and Sanjiv Khanna, said, "Having clarified the matter we deem it appropriate to seek explanation of Gandhi." While giving liberty to Lekhi to file additional affidavit to support her criminal contempt petition against Gandhi, the bench said: "We further observe that no views, observations or findings should be attributed to the Court in political address to the media and in public speeches, unless such views, observations or findings are recorded by the Court." Latching on to the apex court's clarification to attack Gandhi, Lekhi asked how a man who does not understand 'constitutional morality' and 'democratic traditions' would represent Indians in Parliament. Gandhi was raking up the issue on India's Rafale fighter jet deal with France to hide his own family's corruption. She was apparently referring to the National Herald case involving Rahul Gandhi and his mother Sonia Gandhi for alleged cheating and misappropriating funds and the Enforcement Directorate case against the Congress chief's brother-in-law Robert Vadra in a money laundering case. Saying that it will provide an explanation to the SC for Gandhi's remarks, the Congress accused the BJP of distorting the Congress leader's statements. "They (Supreme Court) have sought an explanation. We will give an explanation to them," senior Congress leader Kapil Sibal told reporters, when asked about the SC direction. "Remember Modi Ji when he had said that the Supreme Court has 'given me a clean chit'," Sibal said, seeking to equate Gandhi's comments with Modi's on the Rafale jet deal. Congress spokesperson Abhishek Singhvi said Gandhi had not intended to distort the Supreme Court order and accused the BJP of doing so. "No body can suggest and nobody was intending to suggest and nobody has suggested that the Supreme Court in a judicial order will see political campaign word like 'chowkidar chor'. "How can that be the intention of any one and it was certainly not the intention. It was misled, distorted out of context and we will give a full fitting reply," he said. "It is fair enough. That is the legal process. It is a notice and the BJP is bound to cite it as a final order of judgment and we all know that they are equally guilty of distorting if they allege distortion by us, if they call it a final order," Singhvi said. He stressed that the court has only given a notice to Gandhi to explain his position. "You can be rest assured that we will give a comprehensive, strong effective explanation. Let me be very clear the words are obvious there for everyone to see, nobody is squabbling on the word. "The interpretation given by the BJP is completely distorted and we will present to the court how, why and in what manner," Singhvi said. If not Rahul, who can lead the Opposition?